Get a one time yard clean up in Phoenix from the professional landscapers at Earthtones Landscape Management and save yourself some serious time and money! We serve customers from all over Arizona, and we do one time yard clean ups in Scottsdale, Glendale, Peoria and Mesa as well – if you live anywhere in the Valley area we’ll take care of your property and make it look like new again. Contact us now to learn more and get a no-hassle, no-obligation quote. Frequent dust storms, fierce winds and the unrelenting sun form a potent one-two punch on your lawn, so properly maintaining your landscape is critical to its overall health and well being. Before you look to other Phoenix landscape companies to help you maintain your lawn, see what Earthtones Landscape Management can do for you. We know that after you hear about our low prices, unmatched work ethic and talented crew of landscaping professionals, you’ll wonder why you hadn’t called us sooner! If your property has been damaged recently, or simply needs some sprucing up, contact Earthtones Landscape Management for a one time yard clean up in the Phoenix area. We can clear broken limbs from trees and bushes, trim foliage, mow lawns, fix landscapes damaged by the ravages of nature, and so much more. Have a unique clean up situation? No problem! We’ll make your yard like new in no time, and at a price point you can feel good about. Earthtones Landscape Management serves both commercial and residential clients in the Valley. 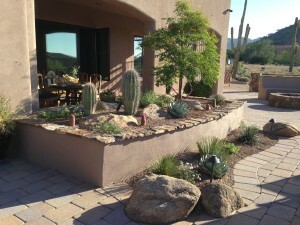 For one time property clean ups in the Phoenix area, contact Earthtones Landscape Management today. If you would like to discuss a recurring yard clean up agreement with us, we’d be happy to talk with you about our weekly/b-weekly/monthly yard clean up services, or our general landscape services. No matter the job, Earthtones Landscape Management has your lawn’s best interests in mind, and we’ll work with you, the property owner, on crafting the perfect lawn or desert landscape you deserve.